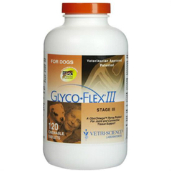 Shop for pain medications to treat your dog's hip dysplasia at VetDepot.com. Hip dysplasia is a common condition in dogs that is characterized by an unstable, loose hip joint. The disorder affects development of the hip joint in younger dogs so that the connective tissue and muscles that function to support the ball and socket joint are weak and lax. Due to lack of support, the two bones that make up the ball and socket joint move apart from each other, causing the joint to become unstable. "The damaging effects of hip dysplasia can be reduced, however, and proper diet and exercise, anti-inflammatory medications, pain relievers, and supplements can slow the progression of the disease." Canine hip dysplasia may affect one or both joints and affects some dog breeds more than others. German Shepherds, Pugs, Bulldogs, English Setters, Golden Retrievers, Beagles, and many other breeds have a genetic predisposition to developing hip dysplasia during development. 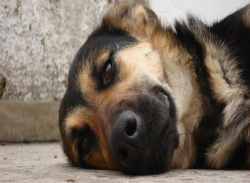 Symptoms typically develop between 5 and 13 months of age, but some dogs may experience only mild discomfort early on. This can make diagnosis difficult. When symptoms do appear, they generally include rear leg stiffness, especially after exercise, difficulty climbing hills, dragging of the rear end during rising, and a reluctance to exercise or climb stairs. Some dogs may also tilt their hips down when any pressure is applied to the rump. Symptoms tend to worsen over time, with early symptoms occurring most often following exercise and later symptoms occurring daily, regardless of activity level. Early diagnosis can prevent needless pain and suffering and helps prevent damaging arthritic changes related to the disorder. The condition is often treated surgically and several different surgical options are available, depending on your dog’s size, age, overall health, and the severity of his condition. Unfortunately, surgery is expensive and poses serious risks. For this reason, many pet owners choose to treat hip dysplasia medically when possible. Weight management is one of the most important treatments for canine hip dysplasia. If your dog is overweight or obese, make dietary changes and implement an exercise program with the help of your veterinarian. Losing weight can reduce joint strain, prevent joint degeneration, improve mobility, and decrease pain. Daily massage, physical therapy, and lifestyle changes can also help. Supplements with glucosamine and chondroitin can increase cartilage synthesis, help repair damaged cartilage, and improve overall joint health when taken long-term. Perna canaliculus, avocado/soybean unsaponifiables, omega-3 fatty acids, and methylsulfonylmethane (MSM) are also beneficial to dogs with hip dysplasia. Additionally, anti-inflammatory drugs, such as Novox and Rimadyl, can reduce pain and inflammation to improve mobility and promote exercise. Because hip dysplasia is an inherited disorder, there is no effective means of preventing its development. The damaging effects of the condition can be reduced, however, and proper diet, sufficient exercise, anti-inflammatory medications, pain relievers, and supplements can slow the progression of the disease and improve quality of life for your pet.